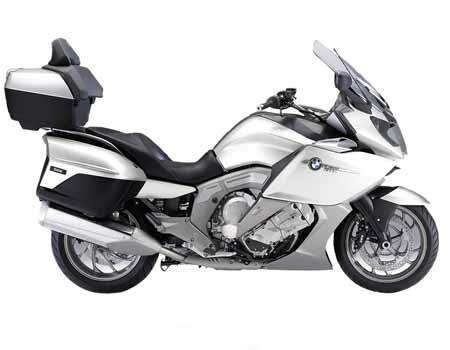 BMW K1600 is a motorcycle with a very sporty appearance. It belongs to the touring range of motorcycles. It is expensive of all the two wheelers of BMW. It is sold through only 1 of the BMW dealerships namely the Navnit’s BMW car dealerships. It has been designed on bridge type frame which is made up of aluminum. The front of bike has two discs while the rear end has one disc each of 320 mm. It has ground clearance of around 146 mm and wheelbase of 1,680 mm. It weighs around 295 kg and has 2 versions with different ex-showroom price. GT – This bike has 1649 cc engine, manual transmission, 22 kmpl mileage and ex-showroom price of INR 33,21,246. GTL – This bike has 1649 cc engine, manual transmission, 22 kmpl mileage and ex-showroom price of INR 36,28,746.